Two days ago, on March 9th, the Vancouver Aquarium’s role in conservation, rescue and rehabilitation, and research was forever altered after the Vancouver City Park’s board voted to prohibit the housing of cetacean species, which includes all whales, dolphins, and porpoises. The Association of Zoos and Aquariums called the decision “troubling”. And, in a politically correct world they’re right. But, let’s not be politically correct for a second. Let’s be blunt. Let’s call a spade a spade. Let’s call this ultimatum what it really is: irresponsible. The Vancouver Aquarium has been a major contributor to cetacean research and conservation for the last fifty years. Notable projects include data collection of killer whale vocalizations, the metabolic rates of pacific white-sided dolphins, communication patterns between beluga mothers and offspring, echolocation abilities of multiple species, and the rescue and rehabilitation of several whales, dolphins, and porpoises, three of which still call the Vancouver Aquarium home. Currently, the Aquarium houses only three cetaceans, Helen (Pacific white-sided dolphin), Chester (false killer whale), and Daisy (harbor porpoise). ALL of which were RESCUED. So, let’s walk through this step by step with Daisy as an example. Stranded for unknown reasons in 2008, Daisy was rescued as a one-month old calf suffering from severe dehydration, emaciation, and muscle loss. At first, she was so weak and malnourished, she did not have the ability to hold herself up in the water, let alone swim. After nearly a year of rehabilitation, during which time the Vancouver Aquarium’s animal care staff members gave her the best possible support through their knowledge and expertise, Daisy beat epically long odds and thrived. Deemed non-releasable due to the fact that she never learned to hunt and survive in the wild, the Vancouver Aquarium became her permanent home in 2009. In the years that she’s lived at the Vancouver Aquarium since, Daisy’s story has touched hundreds of thousands of people. She’s helped educate the public about her species through presentations called “Porpoise Talks”, connected and interacted with guests as she displays her curious side, and participated in research studies that have helped reveal details about porpoises that are assisting researchers and conservationists in saving multiple cetacean species today. Her journey also mattered when Levi, an adult male harbor porpoise stranded several years later in March of 2013. 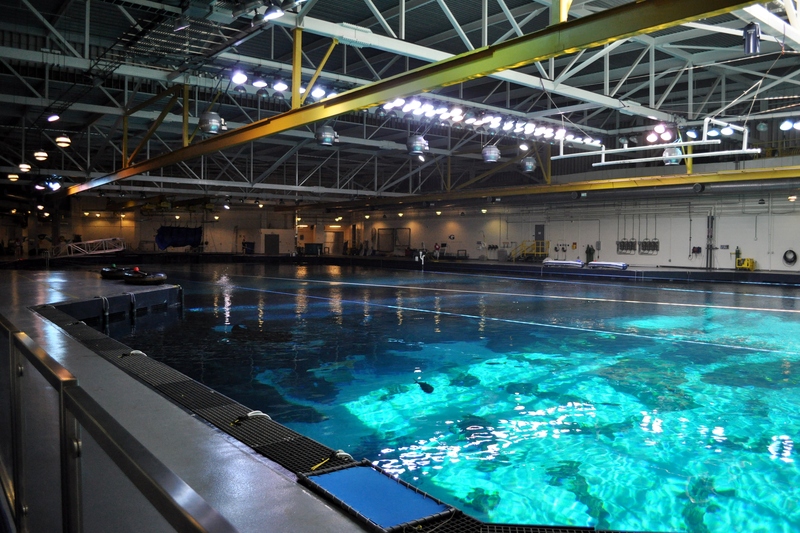 In the same way Daisy was not able to support herself in the water, neither was Levi, and in similar fashion to the previous situation, the experts at the Aquarium fashioned a custom-made raft and cared for him during his several months of rehabilitation. As he improved, Levi became a candidate for return to the wild. And, in September of 2013, six months after he was found stranded on the shore of Saanich Inlet, Levi was swimming in the ocean again. But with the foolish decision made just two days ago, successful stories like Levi’s and Daisy’s, stories of survival and scientific progress, will become few and far between, if not completely nonexistent. What happens next time? When an animal flounders, in need of help, who will be there to assist? Where will that animal go? Without the Vancouver Aquarium, which is one of Canada’s only teams with the expertise and availability to save stranded cetaceans, the next time a porpoise, dolphin, or whale strands, that injured/ill animal will have to be transported several hours to the next rehabilitation center *IF* there is one available. And let’s hope there is, because the only other option is for the animal to be euthanized by drug or bolt gun. There are repercussions for the actions set forth by this reckless decision. This vote, made for political reasons alone, in hopes to appease the, admittedly loud, but small, unqualified minority, is a setback in the scientific study of cetaceans and also jeopardizes the lives of future animals in distress. Yet, while I am angry and distressed by those consequences, as all cetacean-lovers should be, I am not surprised that the board caved to aforementioned uninformed protestors. We live in a blind society that values unscientific, short-sighted philosophies more than the wellbeing of individual animals and entire species. We live in a society where documentary filmmakers attempt to damage and dismantle reputable zoological facilities with lies and twisted information without considering what that means for future distressed and stranded animals. A society where the same soccer mom who condemns and vows to boycott world-renowned aquariums on Twitter also hypocritically demands “rescue the dolphin!”, not understanding how the same professional entities they choose to attack are needed in order to give that animal a future of any kind. A society where PETA finds the money to brandish billboards with crass images and grossly tactless misinformation to slander the zoological community’s hard-working, well-educated animal care specialists who have dedicated their lives to reviving individual animals and researching whole species, and yet donates NOT A SINGLE DIME to cetacean rescue, research, or conservation. Meanwhile, accredited organizations like the Vancouver Aquarium, are actively participating in research and conservation that directly benefits killer whales, belugas, harbor porpoises, and the most endangered marine mammal in the world: the vaquita. In fact, some of the acoustic research conducted by researchers at the Vancouver Aquarium with the help of Daisy, is currently being used to help locate the remaining thirty individuals of the elusive vaquita species in hopes of bolstering the population and bringing them back from the very edge of extinction. Whales, dolphins, and porpoises are intriguing, charismatic animals, and as such, have garnered adoration and attention from many. Shutting down reputable zoos and aquariums, organizations that help research, conserve, and rescue animals is not helpful. However, it is admirable to want to make a difference. Zoos and aquariums encourage and need your help, because when animals and species are in need, very rarely do the loudmouthed armchair-activists actually show up. Save the dolphins. Recycle discarded fishing line. Choose reusable bags instead of plastic when you go to the grocery store. Volunteer as part of a marine mammal rescue team. Save the porpoises. Donate to VaquitaCPR. Refuse to participate in balloon releases. Organize a beach cleanup. Save the whales. Eat sustainable seafood when you’re ordering fish at a restaurant. Visit a responsible zoo or aquarium involved in rescue, research, and conservation programs. And then, teach others how to care for them too. We all have the power to make a difference for these animals, but it should be the right kind of difference. It should be one based on science. It should be one based on correct, factual information. It should be a responsible one full of action that benefits them now and in the future. So, for the love of cetaceans, choose to make the right difference and pass it on. The Georgia Aquarium, the largest aquarium of its kind in the world, opened its doors in late 2005 as a gift to the people of Atlanta from the co-founder of Home Depot, Bernard “Bernie” Marcus. Determined to bring the ocean 300 miles inland to the metropolis capital of this southern state in which his company originated, Marcus donated 250 million dollars to the venture, declaring that this facility would educate visitors of all ages about the animal world, promoting “stewardship in conservation”. Quickly becoming one of Atlanta’s most popular attractions, the Georgia Aquarium is the only facility in the western hemisphere to house whale sharks. The largest fish in the ocean, whale sharks can grow to be over thirty feet long and weigh roughly twenty tons, and the Georgia Aquarium’s Ocean Voyager exhibit boasts four of these animals. While imposing in size, this animal is a filter feeder, meaning that it scoops small fish and plankton, but not much else is on the menu. In fact, though these animals’ mouths can be up to four feet wide, the size and shape of their esophagus inhibits them from swallowing anything larger than a quarter. These feeding restrictions and habits have forced the aquarists at the aquarium to implement some rather unique techniques when lunchtime rolls around. The sharks’ caretakers cannot simply toss buckets of food into the water and cross their fingers that each individual gets its share. Every ounce of food for each animal is calculated every day and is prepared with the same accuracy in cleanliness that your food is in a restaurant. The USDA even evaluates and inspects the kitchen, which, in the zoological world, is called a commissary. The sharks also lack the ability to sit in front of the aquarists with its head tilted upwards waiting for an afternoon snack. Whale sharks must constantly be on the move as it is this movement that forces water into their mouths and over their gills, giving them the ability to breathe. Being that the sharks cannot be stationary, at feeding time, the aquarists climb into inflatable boats and use what could be described as shark-sized spoons to deliver a mixture of krill, shrimp, and nutrient-rich gel to each shark as it swims alongside. The hardworking aquarists use a cable or line system to pull themselves, the food mixture, the very large utensil, and, of course, the boat across the exhibit (which is about as long as a football field). Alice, Trixie, Yushan, and Taroko, the four whale sharks at the aquarium have been trained to follow their own boats, each only being fed from a specific “lane”. This activity occurs several times a day and, in total, the whale sharks are offered nearly twenty thousand pounds of food each year! View from above the Ocean Voyager exhibit. Look closely to see the feeding boats and cables. Not only does each shark get a specific diet, tailored just for them, but for each animal in its care, the Georgia Aquarium develops a healthcare plan to ensure their residents’ wellbeing. For the whale sharks, that means a variety of data collections, including behavior analysis, body measurements, and blood draws. Because the Georgia Aquarium is in the unique position of being one of the only aquariums to care for and study these animals (the only one outside of Asia), it has the opportunity to research and discover many “firsts” that help us learn more about the specifics of this species. For example, it was the first in the world to study and assess the biochemistry of whale sharks. By comparing the serums of healthy animals to those of unhealthy animals, researchers from the Georgia Aquarium were able to determine that certain markers in a whale shark’s blood could indicate its general health. 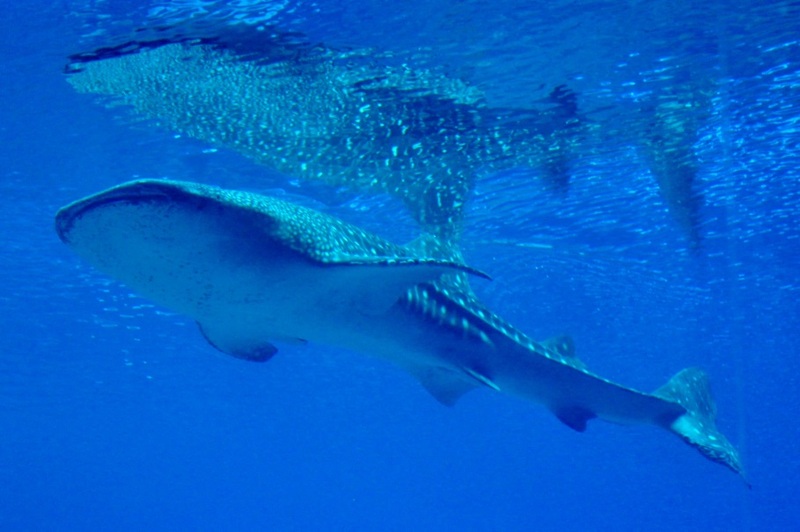 Implementing a science known as metabolomics, which involves identifying substances necessary for metabolism, and using advanced technology such as a mass spectrometer, the researchers discovered that the metabolite homarine, as well as twenty-five more compounds, was a meaningful indicator in evaluating the health of a whale shark. Now, that’s a lot of aquarist/biologist/shark-expert jargon (and, if you understood, feel free to read more about it here), but basically, what that means is that, not only does this information assist those who work with these animals every day, but it also has the ability to aid the scientific community in the field as they continue the attempt to conserve this species. Listed as vulnerable on the IUCN’s red list, whale sharks are still hunted in some parts of the world. The Georgia Aquarium acquired its four sharks from Taiwan, a country that, at one time, killed sixty whale sharks in one year, but has now reduced that figure to zero. 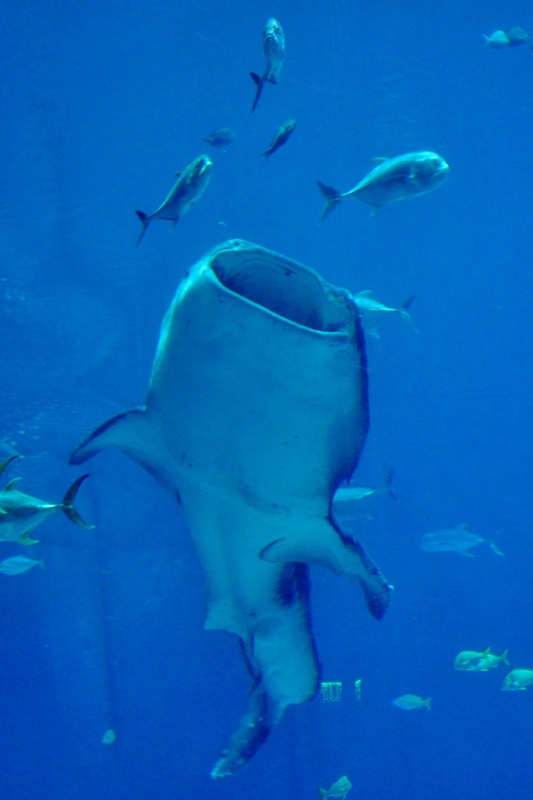 The government of Taiwan has since partnered with the Georgia Aquarium in hopes of leading as an example for other countries to follow suit in whale shark conservation. A whale shark cruises near the surface of the water. Conducting research on whale sharks in the wild is no easy task. The whale shark population continues to trend downward and scientists still know very little about their ecology, including growth rates, longevity, and migration patterns. The Georgia Aquarium is not only doing research on property, where the Ocean Voyager exhibit provides the opportunity to observe these animals as researchers learn about their growth rates, age at maturity, and behavioral tendencies, but also in the field, as they have become official partners with Project Domino, an organization that uses satellite tags to track individual sharks. Early studies have shown that one individual traveled over eight thousand miles, a journey that took more than three years to complete. If you are interested in the Georgia Aquarium and their research projects revolving around whale sharks, there are a couple ways you can help. 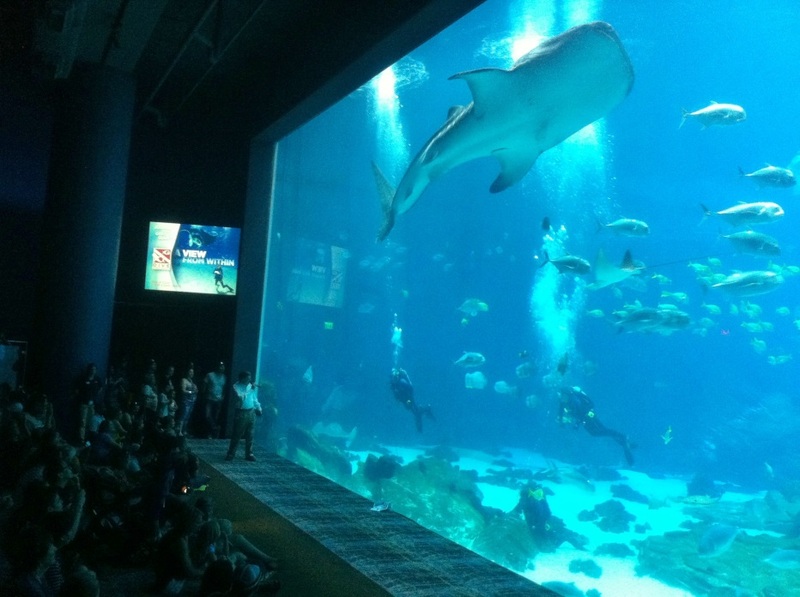 The Georgia Aquarium, which is a 501c3 nonprofit organization, relies on the public’s support through donations and attendance. So, one way to help is to go and witness these animals up close. You can even learn about these animals from a diver while he/she is inside the exhibit! But, there are even more immersive ways to learn! If standing outside the habitat still feels too far away, you can get even closer by snorkeling or scuba diving inside the exhibit. Thank you for being interested in whale shark research, of which so much could not have been conducted without the help and expertise of the Georgia Aquarium. And, of course, thank you for visiting Zoos Are Important!